HOMER — At times, we struggled to move in any direction without killing something. Barnacles and tiny mussels beneath limp flags of bull kelp crunched under our feet. Dark-ringed burrowing anemones, at times blending with ripples in the wet sand, also succumbed to our plodding. When we placed our hands on seaweed-draped boulders for balance, we pressed plate limpets, black leather chitons and other tiny invertebrates tucked beneath the green fronds. Every patch of stone, every seam of coal, every stream and pool and swath of sand seemed home to something alive — and during the extremely low Kachemak Bay tides earlier this summer, niches normally hidden and protected from clumsy, meandering humans were exposed. My tidepooling friends and I explored as carefully as we could, methodically working our way hundreds of yards offshore in search of the familiar — sea stars, urchins, anemones and the like — and of life we'd never glimpsed before. An amazingly diverse world exists just offshore beneath the churning waves and shifting sediments of Cook Inlet near Homer. Given the inlet's sometimes steely swirl and the gray-brown stretches of beach just below the wrack line, it's surprising how colorful some of the denizens of that underwater world can be. Christmas anemones can be packaged in bright reds and greens. 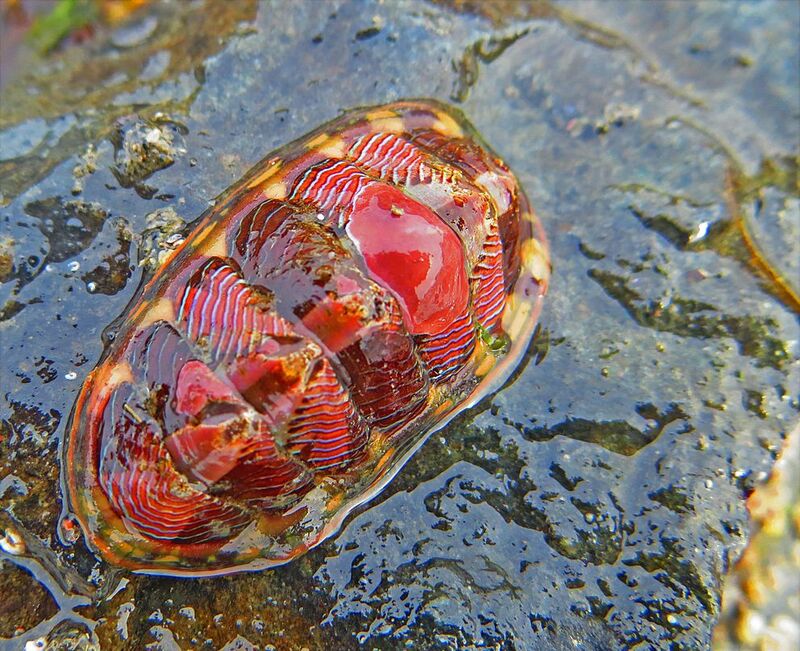 Lined chitons glimmer with alternating pinstripes of pink and mauve and pale blue. The road-hazard orange of a blood star leaps from its monotone environs. The shapes of these marine inhabitants are every bit as varied as their coloration. Filling every possible niche are animals that appear almost alien — spiked, horned, multi-legged, multi-armed, spongy and gelatinous — from the sculpin, isopods, hermit crabs and sand shrimp that almost appear to return our stares to the tide flat's myriad eyeless creatures, including sea pork, piddocks, clam worms and nudibranchs. Sensitive to vibrations, pressure and sometimes light, these expressionless invertebrates retreat to safety as rapidly or cautiously as they are able. Anemones and calcareous tube worms retract their tentacles. Hermit crabs tip over their carpetbagger homes to conceal themselves beneath calcified armor. Isopods, tiny shrimp and gunnels scurry or slither to cover. Others move almost imperceptibly. A green sea urchin we saw caught in a strong current over an algae-splotched ledge of coal began a creep difficult to discern. Similarly, fleeing limpets and chitons navigated stony surfaces with the fascinating rapidity of ice forming across a winter pond. A friend briefly hoisted a blood star that lay in a small pool and turned it gently to examine its underside. Then, as an experiment, he laid it back in the water upside-down. The result was mesmerizing, despite its exquisite slowness: The sea star curled and contorted its five arms to hoist itself up and back into its original position. All around us were animals making adjustments as their world first drained and then gradually began to refill. Rock-boring clams poked their siphons from the sand or the gray patches of Swiss-cheese-like colonies to send small jets of water airborne. Anemones and sea cucumbers drooped from rocky undersides, surrendering to gravity and a loss of buoyancy. Worms squirmed for cover. Beached sand lances wriggled for water as gulls hunted them, probing the boulder-laden terrain, stabbing quickly with hungry yellow beaks and swallowing greedily. 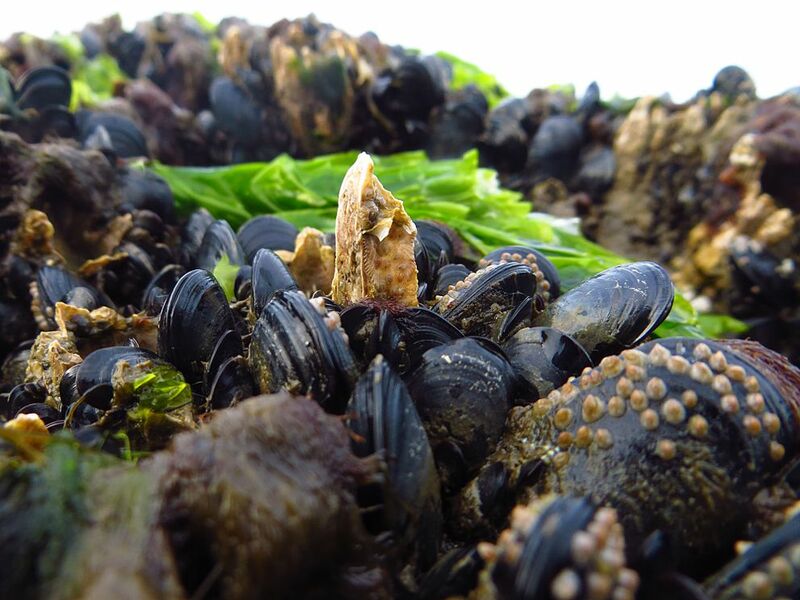 On an adjacent section of beach, crows pried blue mussels free of their beds, carrying them aloft and dropping the bivalves onto boulders to fracture them and expose the meat inside. Nearby, on a large, kelp-curtained, barnacle-encrusted boulder, an immature bald eagle eyed the gulls and stoically surveyed the ebbing sea. As the tide turned, we moved leisurely inland and carefully began levering up rocks to peer beneath for other signs of life. Some peeks yielded spectacular results — a stewpot of hermit crabs, seaweed isopods, tiny pink shrimp, an array of snails, bristly carapace crabs, plus limpets and chitons and tiny anemones — a brief flurry of activity as new shelter or a better defensive posture was sought. Occasionally, we were at a loss to identify all parties in the roiling mass of life we found even though I carried a laminated copy of "Beachcomber's Guide to Intertidal Marine Invertebrates of Southcentral Alaska." The results beneath other stones were more sedate — a few Braille-like dots of miniature barnacles, a red ribbon worm and perhaps a mossy chiton or two. Guessing what might appear was usually fruitless. Each niche uncovered was like a gift unwrapped. Once a person begins to see — or, more accurately, begins to see how to see — the abundance and variety of life teeming on the tide flats and in the pools, the search for more becomes intoxicating. Just the names of invertebrates I've yet to see are enticement enough. How can I resist the lure of the sea peach, the tiger chiton, the opalescent nudibranch, the frilled dogwinkle, the false lemon peel, the breadcrumb sponge, the decorator crab, the peanut worm, the broken-back shrimp, and the many-ribbed hydromedusa? As the sea continued its slow surge toward the high-tide mark, we ambled free of the flats and returned to the wrack line we'd descended from hours before. Grinding our way back to our vehicle over loose sand and gravel, as four-wheelers roared by, we crossed paths with joggers, dog walkers and other tidepoolers. We had seen such a profusion of life, it was difficult to retain it all. Repeated exposure, I presume, will make it easier to remember, easier to perceive the interrelationships in a world so different from our own. 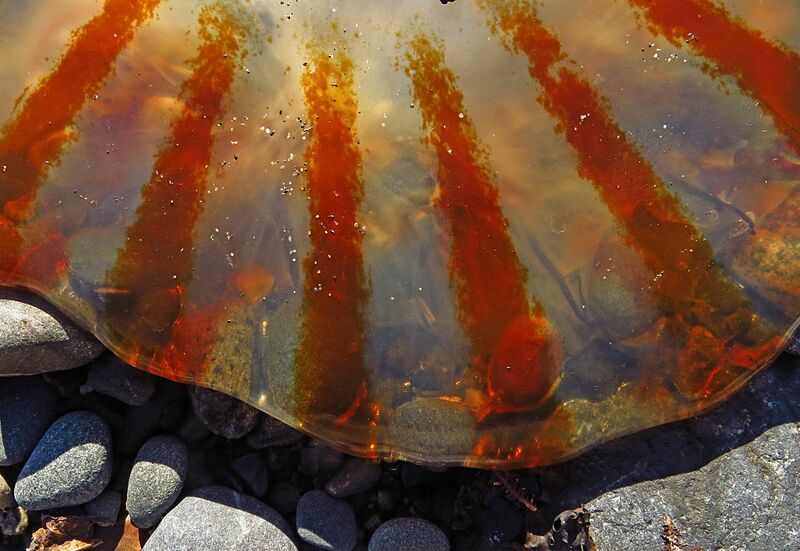 A friend of ours had spent the day tidepooling with a marine biologist across Kachemak Bay, where an even greater variety of invertebrates can be found. She returned from her excursion to regale us with her own discoveries, including a sunflower star, an orange-tipped nudibranch, a gum boot chiton … and an octopus. There's always more to see. Clark Fair is a lifelong Alaskan living in Homer.